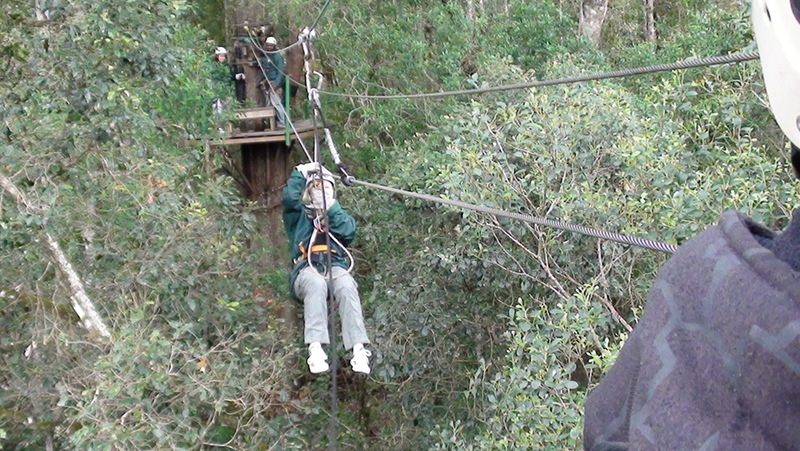 I really couldn’t go to Storms River Village in South Africa without trying the Tree Top Canopy Tour in the Tsitsikamma Forest. It seems to be one of the main activities in the area and best of all, you don’t need any skills to take part! We booked it well in advance and were staying in the village the night before. It was only then that I began to think maybe we had made a mistake and that there might be a scary morning in store for us. Should we chicken out? We decided to go but there were butterflies in the tummy when we arrived at the office of the tour company the next morning. There were three other people there who would join us on the tour. There were three guides allocated to us also, one of whom was recording the event and we were going to purchase a dvd afterwards. We were given a briefing of what was to follow and shown the equipment etc, then we signed on the dotted line and went to get kitted out for our adventure. That done, we climbed aboard the truck that would take us to the starting point. I suppose the main fear we had was not knowing how we would be making it to the first tree top – I mean, I hate ladders completely!! We need not have worried, the first tree top is easily accessible from the drop off area – no ladders or climbing involved! 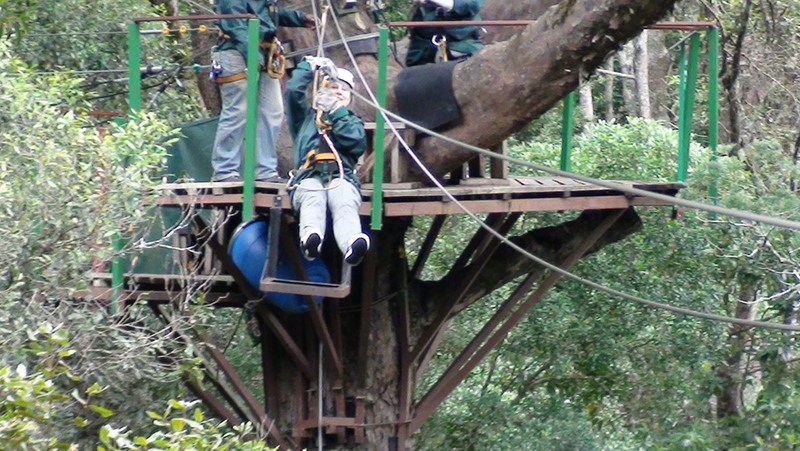 The tour involves sliding to and from platforms atop giant Outeniqua Yellowwood trees some 30 metres above the forest floor. The lead guide goes first each time and is there to ensure you make it safely to the next platform. The main guide ensures you are safely secured to the line before you make the slide. Although the first one was a bit nerve wracking as you venture into the unknown, we need not have worried one bit about this activity. We felt completely safe and there was no fear whatsoever after the first one. The slides get longer as you go on, with the longest one being 100m in length. A pro at this stage! There were 10 slides in total and we thoroughly enjoyed every second of this tour. The guides were very professional but great fun and they were even interested in learning a few words of Irish! Lunch is included in the price and is served when you get back to the village. The cost is ZAR450 (about e45). If you wish to purchase a dvd of the tour, that will cost an extra ZAR145 (or e15). Your money is well spent as the group that runs these adventure tours is involved in job creation in the area, in providing training to local people and is committed to helping in the challenge of social development and in the eradication of poverty. Storms River Village is located some 75km from Plettenberg Bay along the world famous Western Cape Garden Route. There are also plenty of other activities to be enjoyed in the area and Storms River Mouth is also well worth a visit. Next PostThe most imaginative Caprese Salad – Ever!